Before delving into the discoveries of the research volunteers the documents need to be considered in historical context, at local, national and international level. It is also important to consider a collective analysis of the information, before examining the documents on an individual basis. In 1513 England and Scotland were still separate sovereign nations and relations between the two have a long and turbulent history. The end of the 15th century saw frequent cross border military skirmishes which left its mark on both the people and the landscape. In an attempt to remedy the situation in 1502, Henry VII, (Henry VIII’s father), had brokered the ‘Treaty of Perpetual Peace’. Key to this Treaty was the marriage of his daughter Margaret Tudor to King James IV of Scotland. Thus the first tentative steps towards unification of the crowns and long-term peace between England and Scotland were taken. 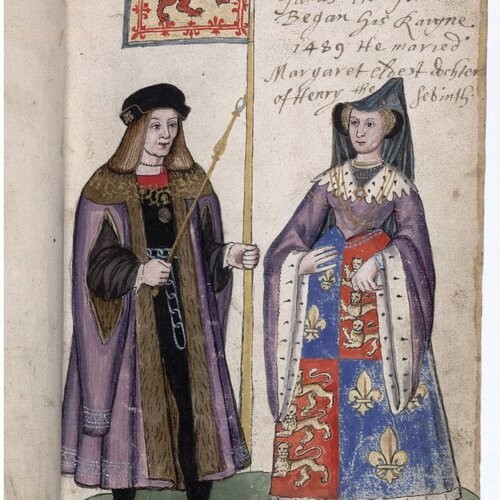 James IV and Queen Margaret from the Seton Armourial, 1591. Reproduced by permission of Sir Francis Ogilvy and the National Library of Scotland. The ‘Treaty’ sought to adopt a simplified system of administrative order and governance within the border regions of both countries. The ‘Borderlands’ had been divided for centuries into six defined areas or ‘Marches’. Three to the north of the border in Scotland and three to the south in England. These were known respectively as the East, Middle and West Marches. Each March was overseen by a warden who administrated a unique form of legislation known as ‘March Law’. These laws sat in parallel to the common law of each nation, some of which in modern terms may seem harsh or unjust. However, it is important to remember that in the early sixteenth century people may not have thought as we do today. They may have had different values, and priorities from our own. Regardless, these laws had far reaching effects. feature of the countryside today. Collectively such unrelenting unrest played an important part in the politics and way of life in the region where the battle took place. France and the ‘League of Cambrai’. Reproduced by permission of the Berger Collection, Denver Art Museum. As a result of Henry’s military support for the pope against France, a plea for assistance under the terms of the ‘Auld Alliance’ was sent by the French King Louis XII, to James IV of Scotland. This led to tension once again brewing on the border with Scotland. The Earl of Surrey was dispatched northward in 1512 with an Army to prevent war and to quell local skirmishes. It would appear that on this occasion, the army didn’t reach the Scottish Border and progressed no further than Pontefract where the mission was aborted. However, the document transcribed referred to as the ‘Benstead Accounts’ which refers to this mission in 1512, contains a wealth of information regarding the size and cost of mounting such a military campaign. The following year, on 30th June 1513 Henry departed for France with an invasion force consisting of many of England’s fighting elite, drawn mainly from the southern counties. This left the fighting men of the midlands and the north available, should they be required to fight elsewhere. As he left, Henry entrusted the guard of the border with Scotland once again to the care of the Earl of Surrey. In anticipation of Scottish action, The Earl of Surrey had begun preparations for a counteroffensive. The contemporary chronicler Edward Hall describes Surrey’s preparations and progress north in some detail in ‘King Henry VIII’ Volume 1, commencing at page 96.9 Thus, it appears that a battle was inevitable. The following paragraphs illustrate what can be discovered when documents are correctly transcribed, and considered collectively with other contemporary sources. It further demonstrates that if a document is examined in isolation, it should be done so in its entirety rather than on an ‘extract by extract’ basis. The vast majority of the documents transcribed were English in origin. This was not a deliberate decision, but due to a sparsity of surviving Scottish equivalents. Therefore the information they contain, particularly in the narrative accounts the ‘Articles of Battle’ and ‘Trewe Encounter’ will undoubtedly be biased in England’s favour reflecting their victory. The financial records of ‘Edward Benstead’ relating to the period the Earl of Surrey spent at Pontefract during the abortive mission of 1512 are particularly informative. They immediately add colour by accounting for the coats of ‘white and grene’, at the cost of 4 shillings a piece worn by the entire entourage, even the Clerk, Thomas Warton was issued with such a coat.10 Interestingly the same coloured coats issued to the gunners of the ordnance cost less, at 20 old pence or 1 shilling 8 pence.11 Is this an indication that they perhaps differed in style and material to the rest? The same accounts also detail the craftsmen and trades that made up the supporting entourage: surgeons, carpenters, wheelwrights, smiths, purveyors (to acquire provisions), yeoman carters, harness makers, bowyers and fletchers, as well as clerks and heralds. Their wages are itemised and range from Surrey himself, who received £5 per day, (a staggering £2,500 in today’s terms), to the ordnance gunners at 6 old pence per day, the modern equivalent just £12. The daily wage for the majority of ordinary soldiers and craftsmen was slightly more at 8 old pence or £16. The same amount appears to have been paid as conduct money or travelling expenses for every 20 miles journeyed to attend the Musters. These rates of pay appear unchanged for the following year, which directly relate to the battle in 1513 as accounted for by Sir Philp Tilney. Could the proximity to Hull and the River Humber be of significance? Would it possibly afford an opportunity for supplies to come by sea, incurring minimal overland transportation? Other documents and further research would suggest that Hull was an important source of provisions, so this is certainly ‘food for thought’ and further investigation! In 1513, Hall’s chronicle tracks Surrey’s progress northward to Newcastle, where he waited to be joined by his son Thomas, High Admiral and the fleet of ships under his command.13 This account is the first indication of the prevailing inclement weather conditions as Surrey fears for his son’s safety at sea. The state of the roads can only be imagined and the difficulties it posed to a large army transporting heavy ordnance must have been extremely challenging. Three days after leaving Newcastle the army reached Alnwick and the story is taken up by the ‘Trewe Encounter’. If this dating of the document proves to be correct, then the original ‘Trewe Encounter’ differs very little from the account which appears in Hall’s chronicle. This might suggest the information came from the same source, albeit frustratingly, unnamed. Needless to say, Leland lays the blame for the apparent deforestation of large areas of Northumberland, firmly at the feet of Scottish raiding parties! The ‘chivalric’ manner in which agreement was met between the leaders of both armies regarding the time and place the battle was to take place, forms a stark contrast to the culture of the ‘Borderer’. The complete opposite in fact. Their raiding parties mentioned earlier, relied on stealth, surprise and were often conducted in the dead of night. It is unclear what is meant by ‘pryve tokens’ and would suggest items that were of no worth to the pillagers, or perhaps ‘too hot to handle’. Nevertheless, they provided sufficient means by which the King could be identified. Is it conceivable that they were the sword, dagger and ring that made their way into the Earl of Surrey and the Howard family’s possession? Whilst Hall obviously regards this pillage with some disdain, it may not have been regarded as such within the local community. Instead, it may simply have presented an opportunity to acquire certain basic items from those who no longer had need of them. The local people may also have had differing views on ‘death’ itself. Whilst reverential treatment bestowed upon King James’s body was recorded, no evidence has yet been unearthed, despite in depth archaeological investigation, as to what became of the thousands of dead reported on the battlefield. Barry Prater’s article regarding ‘James IV and the Act of Dispensation’ whilst not directly referring to attitudes towards mortality, does examine the provisions made by James IV before the battle in favour of those who may fall in his service. This document was written at Twiselhaugh on 24th August 1513, and waived the payment of tax normally paid to the Crown upon inheritance. Whether James’s actions were benevolent or motivational, this ‘Act’ was still being referred to in matters of inheritance some fifty years later. No such corresponding arrangement has to date been sourced for their English counterparts, if you know differently, do tell us! Leading on from the apparent plunder of the field is the significance of ‘to the victor the spoils’. Obviously the Scottish cannon and ordnance were a great prize indeed, and deemed worthy of being guarded with further risk to life, but what about other items? A document dated after 9th September 1513 reports harness (armour) sold off the ‘Scottes Field’ and Julie Gregory in her article, ‘Distribution of Horses after Flodden’,18 tackles the distribution of horses following the battle. These horses were being allocated to ordinary men considered worthy of a prize in reward for their service. It provides evidence of the villages, parishes and manors who provided troops in support of Henry. It further demonstrates the distances travelled to the muster points, where men from the various regions joined the main body of the army. As well as piecing together a map to illustrate the geographical spread, Julie further analyses the types of horses, their condition and types of injuries they had sustained. Whether these injuries are a result of battlefield action, or rather indicate the horses were dual purpose in nature, is certainly a topic worthy of further investigation and analysis. For example a ‘spavin’ in the hocks in the hind legs might indicate an animal that has been pulling heavy loads. Equally, the number of ‘injuries’ recorded to the ears of animals, rather than being wounds, may be an early form of ownership identification. What is your conclusion? Please do share your thoughts. Another reference to the dispersal of horses appears in Hall’s chronicle. It refers to a number of ‘geldyngs’ being taken during a skirmish in August of the same year. This would indicate that horses were indeed a valuable commodity, and the taking of them as a prize commonly accepted behaviour. This ‘Muster Roll’ for 1514 was found amongst the records of the Duke of Northumberland. At the time of the battle in 1513, Henry Percy, 5th Earl of Northumberland was with King Henry and his army in France. This particular document although dated six months later, may contain the names of men who fought at Flodden with his younger brother Sir William. It includes information typically found in such a document. The name and often occupation of the man, the equipment and type of horse available to him (if any) should he be called up for service, is itemised. Possibly as a result of the ‘Archery Laws’ the most common weapon in their possession is a bow. Men listed in this type of document would typically be tenants of the Lord of the Manor, who under the feudal system of land ownership or occupation gave their service in time of war as part of their tenancy agreement. It is fascinating to see so many names on the Alnwick Roll such as Stanton, Hodgson and Elder, which are still very much linked to the area today. As such this record and others like them, are a fantastic resource for one-name studies, researchers of family history and local historians alike. challenging to read, are highly phonetic in nature and contain many words that are unfamiliar as they have dropped out of use. Examples such as a ‘grete plompe’19 where plompe means mass, - a ‘great mass’ is used to describe the Scottish army at the commencement of the battle, ‘harness’ for armour20 and ‘scienth’ as in a ‘scienth of men’.21 The meaning of the latter remains unresolved, so any suggestions would be most welcome! This would suggest that language too is subject to an evolutionary process of change over the passage of time. When piecing together a jigsaw puzzle the picture on the box is the guide. In the case of the Flodden jigsaw the pieces that made up the picture needed to be firstly identified, deciphered and extracted, before being reassembled. This process was made more taxing as many of the documents are undated, making them difficult to place in the context of an historical timeline, leaving the guiding ‘image’ incomplete. This was certainly the case with the Exchequer document E 101/61/27 which concerns the ships under the command of Thomas Howard, High Admiral. This document will be familiar to followers of both the Flodden Campaign and the ship ‘Mary Rose’. Extracts appear in many well-known works on both subjects, but as just that - extracts, taken singly in isolation. Never before has the document been analysed in its entirety encompassing the role of the Mary Rose within the Flodden campaign of 1513. Hence these extracts often appear out of context to the events to which they actually relate. The article relating to this problematic document E 101/61/27 contains information on how this issue was resolved. Edward Hall, Henry VIII https://archive.org/stream/cu31924091758288#page/n131/mode/2up, p.
A Transcript of this letter appears in Edward Hall King Henry the VIII pp 77-80. https://archive.org/stream/cu31924091758288#page/n111/mode/2up. Prepared was James IV to Fight by Land and Sea in 1513. pp 60-62 http://openjournals.library.usyd.edu.au/index.php/JSSSH/article/view/7374/7770. Edward Hall Henry VIII https://archive.org/stream/cu31924091758288#page/n131/mode/2up. William Weaver Thomson, Life in Northumberland during the Sixteenth Century, 1897. Information provided by Sean Cunningham, National Archives. Appears in the document known as the ‘Articles of Battle’. Document concerned with selling armour off the battle field National Archives SP 1/5 f.35 4442. Letter from James IV to Dacre - Cotton Caligula B VI Dated 18th July 1513. Bruce Durie, Understanding Documents for Genealogists & Local History. Stroud, 2013.